In the waters around the UK we are blessed with some of the best seafood in the world – everyone claims this in actual fact – the Australians, the Irish, the Spanish, the Japanese… but to be honest, we have a pretty good argument for it. There are few parts of the UK where this argument can be stronger than the west coast of Scotland. The waters there are like Champagne. Crystal clear, crispily fresh and due to the gulf stream bringing currents up from the coast of Africa, Portugal, France and around Ireland meeting again off the coast of Donegal and Northern Ireland, the waters are incredibly nutritious – so much so, that the variety of life there is perhaps some of the most varied and beautiful in British waters... I'm going somewhere with this so bear with me! As many of you will also be aware, there is something else that is great about the west coast of Scotland – the Diving! Stunning visibility, beautiful wrecks, life that you won't see anywhere else in the world… it is not uncommon to find whales, basking sharks, seals and even orca's in the waters there. This part of the UK is a mecca for divers – and not just recreational divers at that. There is a booming scallop diving industry there and it is through a professional scallop diving friend who lives on the remote island of Jura, that myself and a few friends were able to enjoy perhaps the finest barbeque I have ever experienced last summer. Scallops that my friend helped us catch, and more significantly, lobsters. Scottish lobsters, also known as 'cripples' are the crème de la crème of lobster. Considerably more expensive in London restaurants than their Canadian relatives. They are identified by their intensely purple blue colour, which when cooked, turns bright, almost fluorescent orange. The Canadian ones tend to be a more muddy brown colour in the water, turning a more dull orange when cooked. The flesh echoes this as well. I think it is important at this stage to highlight a few important points about lobsters. There are severe penalties for fishermen who remove them. £5,000 and a criminal record! The reason for this is of course to allow stocks the chance to replenish. Female lobsters only breed once every two years and it takes between five and seven years for a lobster to reach the minimum landing size of 87mm measured from the tip of the head to the start of the tail. (Basically the main body of the lobster. 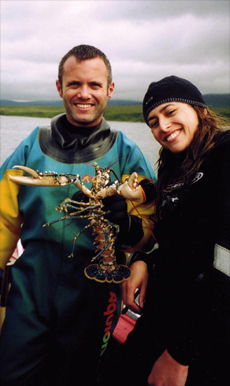 Many fisherman will also do the decent thing of putting a female lobster carrying eggs back into the water, and by cutting a small nick out of her tail, so that she may easily be identified as a female in the future. If you are served a lobster like this in a restaurant, though it is not illegal, it goes against the principals of sustainable fishing, and that will, in the long run, affect us all. Globally! 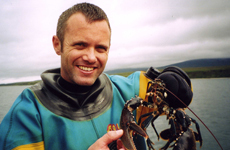 So we've established that Scottish lobsters are in a league of their own. But how can we get the best out of them? If a lobster in a fishmongers is dead, it is easy. Don't even bother buying it. If it's alive, and lively, great. If you caught it yourself, you lucky thing! Below is a recipe that displays true British cooking from it's very roots, using the best of what the land and sea has to offer! It's simply delicious! A beautiful summery dish. A luxury, but a real treat to the taste buds. Jersey royals are in season now, and are simply the king of potatoes. There is nothing else that even comes close! First, prepare the nettles. The flavour is fresher and more intense in the smaller baby leaves, but beware, the sting on the younger ones is vicious so wear gloves! Melt 1 tablespoon of the butter in a medium saucepan. Add the leaves and cook for 1 minute until just cooked and thoroughly wilted. This will kill off the sting. (Bear in mind that they will continue to cook in the residual heat when you remove them from the pan.) Squeeze out any juice and chop finely. You should have about 4 tablespoons of chopped cooked nettle now. To cook the jersey royals, place in a pan of cold water with two sprigs of mint and some salt, and bring to the boil. Simmer until just tender. Chop the remaining mint finely and sprinkle over with a knob of butter. For the tomatoes, drizzle with balsamic vinegar and olive oil, and sprinkle with sea salt and freshly ground black pepper. Roast in a hot oven, about 220oC, 450oF, gas mark 7, for about 5 minutes. For the lobsters, place them in a freezer for five minutes. This puts them to sleep and is deemed the most humane way to kill them. Split them in half by pushing the point of a knife directly through the back of the neck and down through the head in one motion to split the head in two, then turn the lobster around on the board and cut through the length of the tail. Along the length of the tail, you may find a long dark tube – remove this, along with the green liver, known as the 'tomalli' that is in the head. Season the cut side of the lobster well with sea salt and freshly ground black pepper and place the halves, shell side down on a barbeque, hot griddle pan or frying pan. Cook over a high heat until the shell has turned pink and the flesh is cooked. If the shell appears to be burning before the flesh is cooked, place on a tray in a hot oven to finish cooking. Resist the temptation to turn the lobster over as you will drain out all the beautiful juices and be left with dry, chewy meat. In a separate pan, melt the butter for the nettles and cook until it is just starting to turn brown. Add the nettles and allow to sizzle for one minute taking care not to burn them. Add lemon juice and chopped tarragon and pour generously over the lobsters. Serve with the minted jersey royals and roasted cherry tomatoes, with a wedge of lemon and a green salad.